A few months ago when E. was invited to her friend Bella's birthday party I wondered what we could give this sweet little girl as a gift. I stumbled upon little suitcases adorned with French graphics (I thought this appropriate coming from E) at a local boutique here in SLC. The gift was apparently a hit! I honestly felt I'd discovered the perfect gift so I stocked up on a few more for future birthday parties. Doesn't every child love to store (a.k.a. hide from other siblings) or schlep around their favorite little tchotchkes? 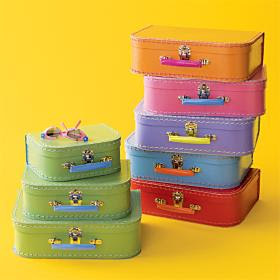 The suitcases pictured here, miniature suitcases based on European lunch box designs from the 60's, are very similar to the ones E. gave to her friend Bella, except these ones come in solid colors, which in my opinion is just as fun and probably more versatile anyway. I think these adorable little objects are the perfect solution to the gifting dilemma we all experience when those cute little invitations arrive in the mail and we want to come up with a fabulous gift by Saturday morning at 10 a.m. These little finds come in colors fit for both girls AND boys. 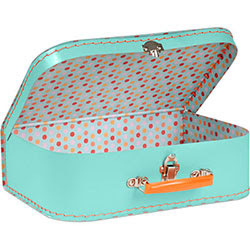 You'll find the best price on these suitcases at www.landofnod.com (thank you Tiffany for the inside info!) and then for a little more money and more color selections you can also purchase them at www.paper-source.com--one of my very favorite sites (see the Beautiful Websites menu on the left hand side of my blog). Locally here in SLC you can find them at The Children's Hour or Artichokes & Co but be forewarned they are more expensive at these stores than online. Caveat: to make this gift extra special fill it with craft supplies (as mentioned earlier) or washable markers & crayons, a little treasure wrapped in bright tissue paper or a small article of clothing. Aren't these soooo darling? They've been selling them at the Paper Source for a while and I just noticed them in The Land of Nod catalog. A friend of mine recently brought me some yummy chocolate chip cookies stuffed in a red box with a thank you note. *SO* darling!